Hello Aspirants, today we will be talking How to clear AFCAT exams.so you all are going to appear for AFCAT written examination. May be you are appearing for the first time or have appeared but not yet cleared AFCAT exams. Don't worry as it is said "Good things take time to happen" you will too Clear AFCAT exams only you have to be disciplined towards your studies and make sure you have a aim in your mind to clear your exam in this coming attempt, your positive attitude is going to show miracle in this and will decide your result. Make sure you never back step from your aim just be focussed and believe in yourself will help you to clear AFCAT exams in one shot. In this article we have discussed some sure shot points which will help you to Clear AFCAT exam papers. We have given points which we had asked some candidates who have already cleared exams and have been recommended in Indian army. Aspirants need to follow this points strictly and regularly and work on their weak points. As only we can understand which are our weak subjects so you need to start preparing for it from right now onwards. Doing so will surely help you to clear your AFCAT exams. Read the article and follow them. Start your studies by making a time table and the subjects you will be studying on each day. If at any point you think of giving up and you are not able to study for AFCAT exams just close your eyes for a minute and just think about the life you will be living once you clear your AFCAT exams and get recommended for SSB. The royal life which you have never experience and the pride while living your dreams. And also just imagine about your parents the happiness which you will see on their face that's the biggest thing which you can give to them when they will see you in your uniform and the shining stars on your shoulders. Hope this motivation will work for you while preparing for exams. So guys back to your studies. Just go through this points and if you have any questions or queries related to AFCAT exams can ask below in comments. 1. Aspirants should know all the subjects and the lessons which will be asked for your AFCAT exams. AFCAT exams focuses on mainly various subjects English, General Knowledge, Reasonong & Mathematics. Candidates should be well known with all the lessons which will be questioned in the exams. 4. Moving ahead is your Mathematics section. This section covers maths question up to your 10th class. Candidates have to learn all the basic formula which will help them to solve the questions quickly and correctly. 'Practice makes man perfect' as it is said this will help you in this section. Also AFCAT paper consists of mental Reasoning section which is like in two parts verbal and non verbal this section is easy to score. Doing practice will help you in solving questions. 5. Aspirants are requested that they should also go through the previous year question papers so that they will be aware of the paper and the type of questions which are asked in AFCAT exams. Candidates can also download the previous year question papers from here - Check. knowledge paper. Candidates are confused as they don't know what they should study and till where. So we would like to tell you just focus on the news which is 6 months back. AFCAT exam paper consists of current affairs generally of armed forces news, newly launched missiles, army, navy, air force exercises, newly appointed ministers, new laws or bill passed or any recent big news, themes of that day etc. Doing this much will help you to easily answer maximum questions. 8. Start your studies right now this is the correct time. Don't think like your academics paper which you can clear in one night. Seriously this will take hard efforts to clear exams. And your aim should not be only to clear cutoff bit also to clear AFCAT exams cutoff with good marks so that you don't have any problem in your merit list. So aspirants this is the golden chance you have got to live your dreams. Get up and make that happen. 9. We JobsFundaz team also have started to give notes on various subjects which are asked in AFCAT written exams. Candidates can also take benefit of it by downloading it and studying through it or also practice from our practise sets questions which we have already posted in Study material section. Candidates can also take the help of it to recognise your weak and strong subjects and this will help you to work where you need to. 10. Lastly, after all this tips the most important CONFIDENT which you should be while solving the AFCAT paper. Many of times it happens that you have studied for the question you are solving but you are not ready to answer it or you are afraid if you answer and it is wrong which will affect your result. 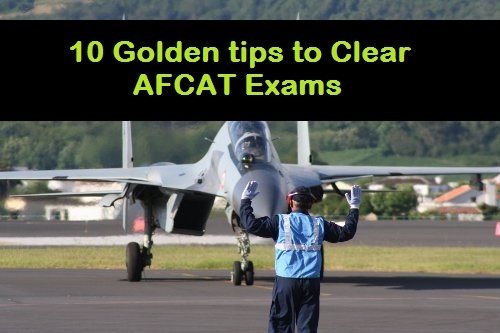 So you have to be confident while solving paper and this will happen if you follow all the above 9 golden tips which will make you confident to clear AFCAT exams. Hope this article will help you in clearing your AFCAT exam paper. Candidates are requested to appear for the exams with full of hopes and confidently which would help you a lot to clear AFCAT exams. Candidates should be confident with the answers they are going with and don't loose hopes for the exams. We know it's not a easy task to clear exams but remember "Nothing is Impossible" so just chase your dreams and just focus on the exams after that its all your comfortable life with full of respects and honour. It's always take some time to be successful it's not in a day or a week you have to make yourself fully dedicated towards the exams and surely it will come true. Just be positive and hope for the best. Candidates are requested to visit our page for more tips and guidance on AFCAT and SSB. Also you can bookmark our website for latest updates on defence jobs or can also follow us on Facebook. Feel free to ask questions or share your knowledge or important notes regarding Clear AFCAT exams with our readers in below comments. Good Luck Aspirants for your bright future!!! i have done journalism and mass communication,so what are the chances or mode of getting entry in IAF?